WIN the brand new cookbook from Andy Bates! 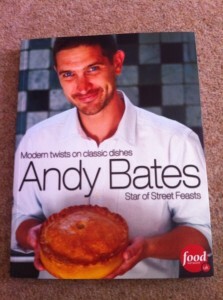 Many thanks to the Food Network for our latest competition prize – a copy ofthe brand new cookbook from Andy Bates, star of TV’s “Street Feasts”. Andy Bates (AKA Pie Man) is renowned for his hearty, traditional British street food which he sells from his stall at Whitecross Street Market in London. Following a successful first series of Andy Bates Street Feasts on Food Network in 2011, he has also now become a leading authority on street food. His new series, “Andy Bates American Street Feasts”, follows Andy on a street food odyssey across the U.S., visiting the most vibrant food destinations and discovering the stories behind the recipes. Each show comprises of Andy meeting the passionate people responsible for giving street food its evolving reputation and he tries his hand at making and then sampling, their specialties. He brings those inspirations back to the U.K. to create his own recipes influenced by what he’s seen on the road. Recipes featured in the series range from Louisiana crawfish balls and jambalaya to braised pork belly and Waldorf salad in a pretzel wrap to apple shortbread pie with honeycomb and Key Lime pie with Caipirinha sorbet for those with a sweeter tooth. Fans of the show can visit Andy’s collection page on Food Network’s website where all of Andy Bates’ content is showcased: Catch up on his episodes, find his featured recipes and browse an interactive ‘Stweet Food Map‘ (Bristol’s own “Bagel Boy” worked with them on this) which shows where to get the best street food in the UK. Fans are encouraged to participate and include their user generated images of the street food on offer. Users can also submit their suggestions for who they think should feature on the map, helping it to develop into a reference point for anyone looking to sample some of the great street food available right here in the UK. Check out the Andy Bates American Street Feasts collection by clicking here. Andy’s new cookbook, available from Amazon, comprises his award-winning pies, pastries and melt-in-your-mouth tarts, to more creative recipes incorporating international flavours. With over 100 recipes to choose from, there’s something for everyone – and I love the way he tells stories throughout the book too. There’s plenty in there that I’m looking forward to making – especially the black pudding scotch eggs, the turkey & ham Christmas pie and an interesting-looking smoke-roasted sea trout with horseradish potatoes and beetroot dressing! The competition will close at the end of the day on Wednesday, November 14th, after which a winner will be chosen. Good luck!